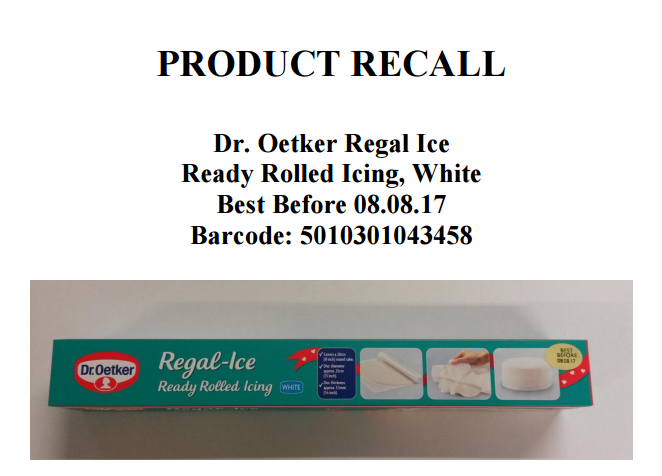 Food company Dr Oetker have issued a notice recalling their Regal Ice Ready Rolled Icing White as the product contains almonds that were not explicitly on the product label as an ingredient. This means that the product could pose a possible health risk for anyone with a nut allergy or intolerance. The recall notice details how a small number of packs were mistakenly filled with ready rolled marzipan (which contains almonds). The recall is preventative, as the packaging does actually warn that the product may contain almonds. However, as they are not specified in the ingredients, Dr Oetker has decided to take the safer option. The FSA advises any consumers who suffer from a nut allergy or intolerance not to eat the product, and instead to return it to the supermarket it was bought at for a full refund.